Bianca's Ristorante in North Fort Myers, FL serves classic Italian dishes, including our famous old-style garlic rolls. Every dish is made from scratch! "The perfect meal is just one reservation away. " "A deal like this makes happy hour at Bianca's especially happy." "There's still time to make your reservation for Easter Sunday! Call (239)-995-3272 -- reservations are filling up fast." "If you haven't tried our wine on tap yet, they are fresh and bright and can be enjoyed in the same condition as when they were kegged." Yes, I'd like to receive news from Bianca's Ristorante. 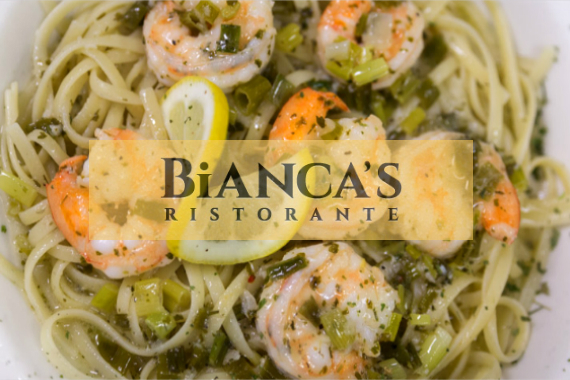 Sign up for the Bianca's Ristorante Newsletter!